PENSIONED OFF. The Board on the cow-catcher of this early Canadian engine reads as follows: “This was the first railway locomotive to operate in Western Canada. Brought to Winnipeg from United States by barge on the Red River in 1876, and ran between St. Boniface and Emerson”. THE building of the Canadian Pacific Railway was the founding of modern Canada. It changed a colony into a great country. The economic and historical importance of the great railway is equalled only by the wonder of the construction itself. The story, like all stories of courage and endurance, has never ceased to arouse admiration. The adventure began in 1857. An Imperial Commission was set up in that year “to inquire into the suitability of the Colony of Canada for settlement, and the advisability of constructing a transcontinental line of railway through British territory from the Atlantic to the Pacific Ocean, and thus to connect and at the same time to provide a safer and more direct means of communicating with the British possessions in the Orient”. Captain Palliser, an officer of the Waterford Artillery Militia, was the leader of a party of explorers who wandered for four years through a wilderness stretching from the border line in the south to the frozen snowfields of the north, and from Lake Superior to the Pacific. It was nothing more nor less than a rough survey of the whole interior of Canada. 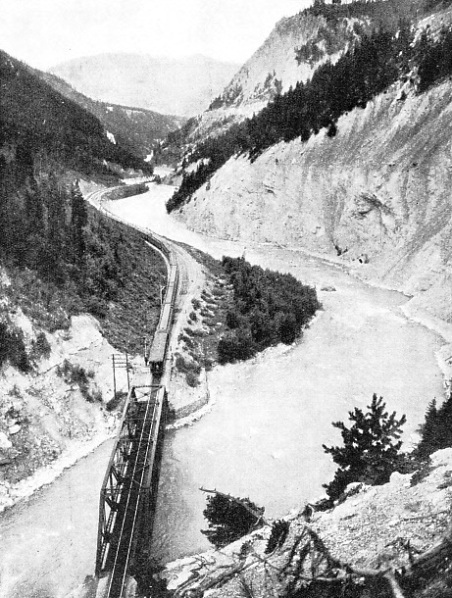 On this early expedition, Dr. Hector, a member of Palliser’s party, discovered one of the great passes through which the railway now runs - Kicking Horse Pass. Near the junction of the river, Dr. Hector was badly kicked by one of the pack horses and, with a kind of grim wit, he called the river “Kicking Horse”, and the pass also received the same name. Five years later, however, Walter Moberly, assistant to the Surveyor-General for British Columbia, organized a light party to explore the Selkirk and Rocky Mountains, and to search for a suitable pass. From the summit of a high peak he saw a valley extending to the distant Shuswap Lake, and a continuation of it running westwardly to the Columbia River, and also a valley entering far south. Before dawn the next day he eagerly set off alone, leaving his companions to follow him into the valley, where he found a stream flowing westward - and another valley to the east. On a cedar tree, he blazed: “This is the pass for the Overland Railway”. Thus Walter Moberly discovered the pass in which, some twenty years later, the rails from the east met those coming from the west, and in which the last spike was triumphantly driven. The courageous pioneer essayed also to cross the Selkirk Range, but with the coming of the winter snows Moberly had to abandon his expedition. Sixteen years passed before the next notable explorer went in search of a way through the Rockies. Acting on Moberly’s suggestion that future expeditions should concentrate in the direction of the south-easterly branch of the Illecillewaet River - an Indian name meaning “fast-flowing stream” - an American, Major Rogers, discovered the pass which eventually enabled the track to be carried through the Selkirks. The account of Major Rogers’ discovery of the pass bearing his name has been written by his nephew, Albert Rogers, who accompanied his uncle on the expedition up the Illecillewaet valley. Reaching the forks of the Illecillewaet, they continued up the valley which Moberly had described in his report as most likely to yield a route through the Selkirks. A mile and a half from the mouth of the east fork they found a tremendous canyon, later named the Albert Canyon, down in the depths of which the river whose course they were following changed to a madly foaming torrent. The late Keith Morris, expert on Canadian affairs, relates in one of his books how for several days the surveyors struggled onwards through a forest in which trees were often smashed to matchwood by avalanches. Then the stream divided, and in front of Major Rogers loomed the main Selkirk range. The finding of a great national thoroughfare depended upon the possible gateways at the head of either of the forks of the stream. Stumbling over snow, in the lee of Mount Sir Donald, Major Rogers and his nephew, their food rations almost at vanishing point, climbed steadily upwards until they arrived at a large, level gap. This they traversed to discover that the water again separated, flowing to the east and west. After hours of arduous toil, nearly losing the four Indians with them, they reached at evening the narrow ridge, where they decided to wait until the next day. At ten o’clock it was still twilight on the peaks, although the valleys and depths beneath were already shrouded by night. The little party stamped in the snow and whipped each other with pack straps to keep the blood circulating. But they discovered the pass. These daring expeditions with their resultant discoveries brought the transcontinental railway nearer. But in the great expanse of land, forming British North America, there was, sixty-four years ago, only a miscellany of provinces, separate, almost independent, and in some instances, isolated. When a proposal was made to link these provinces together in closer co-operation, British Columbia refused to have anything to do with a federation unless she was brought into direct communication with East Canada and the Atlantic by means of a railway. This demand, in 1871, for a railway which would have to cover some three thousand miles, staggered and astonished the authorities. Sir John Macdonald, determined to see the confederation project through, accepted the condition and promised British Columbia that the railway should be completed by 1881. Accordingly, the task of exploration and detailed surveying was entrusted to Sandford Fleming, as engineer-in-chief. Fleming’s problem amazes by its immensity. The forests of Ontario, the shores of Lake Superior, the buffalo-tracked prairies, and five hundred miles of mountains had to be charted as a possible railway route. And no maps existed. Assistance was obtained from the Hudson Bay Company, which was well acquainted with the western trails, as it had to send goods overland to Vancouver. Attached to the company of surveyors were various specialists whose duty was to study and report on the botanical, geological, climatic and geographic features along the proposed alignment and in the adjacent regions. The location of a telegraph was also undertaken. DANGERS OF THE TRAIL. Disputing man’s right to push the iron road through their territory, bears and other wild animals were an added risk to the perils of the route. PIONEERS OF THE RAILROAD. 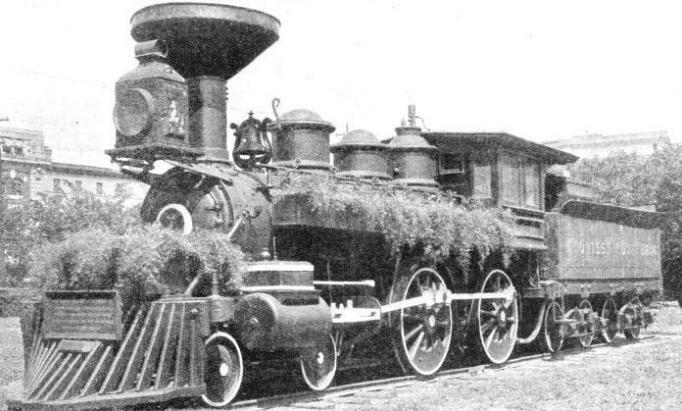 Construction trains such as that shown below were common in the early days. The wives and children of the railway builders were housed in these travelling villages. After Fleming’s surveying expedition had left Montreal, it drove through the dense forests of Ontario, the pathfinders having literally to hew their way westward; and then on to Fort Garry, the Hudson Bay trading post. With Edmonton behind him, the surveyor bore westwards, and a few miles after found Thompson’s historic trail along the Athabasca River and into the Rockies. In the mountains the obstacles were on a gigantic scale. Rocks, forests of fallen trees, rushing glacial torrents had daily to be circumvented. Fleming next traversed the Miette River valley, and crossing into British Columbia, descend-ed by the western slope of the Rockies, following the Fraser River. Passing by Mount Robson, one of the most spectacular mountains in the Dominion, he reached Tete Jaune Cache, and turning south-east, pursued the Canoe River valley to Kamloops. Here he met the familiar trails of Thompson and Fraser and ultimately reached the Pacific Ocean. 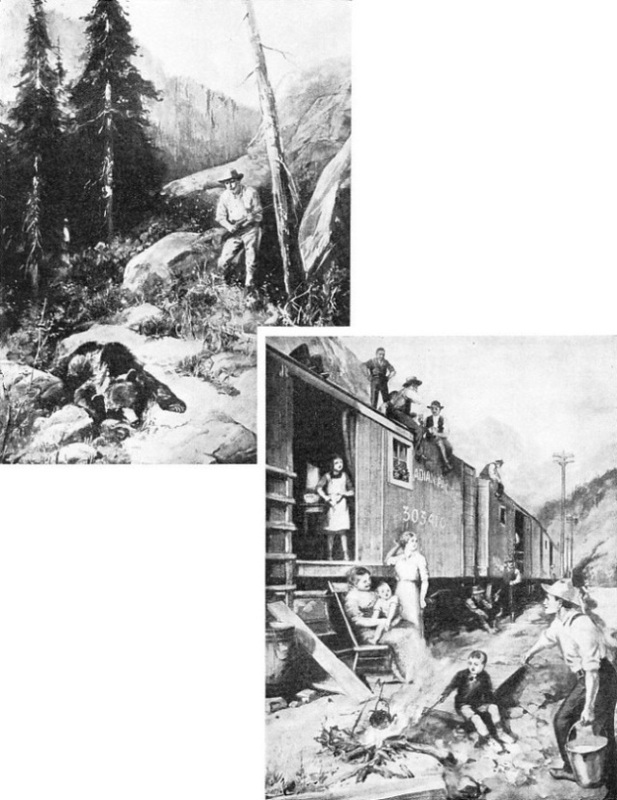 Fleming’s journey is particularly important, for on his survey he linked up for the first time the three mountain passes discovered by Hector, Moberly and Rogers, and his party was the first to travel over the entire route of the transcontinental railway between Lake Superior and the Pacific. In his diary the surveyor describes something of the hardship and privations he and his companions had to endure. In crossing the great and forbidding barrier of the Selkirks, Fleming determined to use the pass recently discovered by Rogers. Rogers himself accompanied Fleming part of the way, while his nephew went the entire distance. They followed the Kicking Horse River and eventually reached the summit of the pass, through which a road could be penetrated. Before they entered the final stages of the journey Fleming said good-bye to Rogers and went on with his own band of pioneers. Halts were frequent. Rain regularly drenched the party. Tall ferns, reaching shoulder-high, and “devil’s club”, a dense, thorn-covered shrub through which they had to fight a way, made them sore and weary to the point of exhaustion. Through alder swamps the progress averaged about three miles a day, and at the end of the stage poison prickles had to be extracted from the hands and legs of the party. Although, after his epic survey, Fleming’s preliminary allocation was rejected, the mass of the information gathered by Fleming was of inestimable value. Little, however, was done. By the end of 1875 thirteen separate lines had been laid through the valleys of British Columbia, eleven of which converged on the Yellow Head Pass and then ceased. Line after line was located and abandoned. The proposed enterprise, meanwhile, had become the source of political bickerings and quarrels. 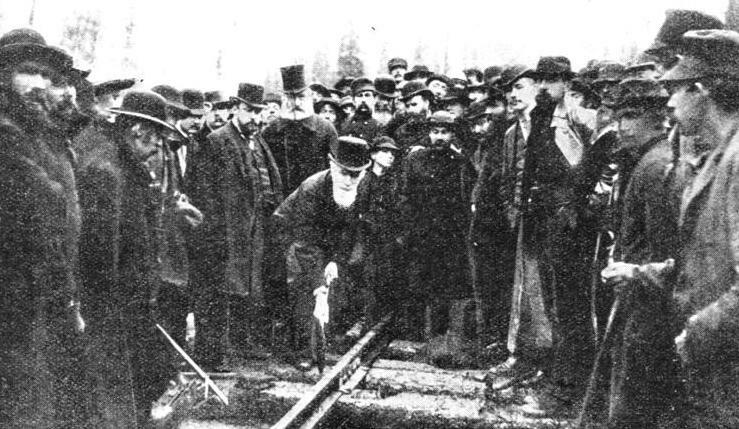 Sir John Macdonald had promised the line’s completion by 1881. In 1879, only 713 miles had been constructed. This delay irritated British Columbia. Secession was threatened if the Dominion Government did not hasten to fulfil its bargain. The Government began anxiously deliberating what steps should be taken when a company - later known as the Canadian Pacific - intervened and offered to undertake the responsibilities and to satisfy British Columbia by completing the line by the spring of 1891. The company demanded £5,000,000, a free grant of 25,000,000 acres and various other concessions concerning right-of-way. The Government accepted. TRACK LAYING. Foot by foot the railway engineers thrust the metals across the continent. This interesting old photograph shows a construction gang resting from their work of advancing the railway over the Western plains. The work began immediately, and progressed until financial obstacles loomed ahead. London refused to invest another farthing in the enterprise. The Dominion Government had to disburse another six million pounds. This grant solved difficulties for the time, but others rapidly followed. The company had to construct 250 miles each year in order to fulfil its contract, while disputes between sub-contractors arose at every point. Again, comparatively few of the labourers could be relied upon to remain at the work; many actually divided their time between the Canadian Pacific, the Northern Pacific, and other American lines! Making superhuman efforts, however, Sir William Van Horne, Lord Strathcona and Lord Mountstephen kept the railhead steadily moving forward. This crossing of Canada by rail from east to west represented a task of incalculable proportions. The builders had to span nearly three thousand miles, tracking, dynamiting, and toiling from ocean to ocean. Over rivers and swamps, through forests and mountains, the constructional gangs had to lay the rails. The workers were drawn from all parts of the globe - Anglo-Saxon shouldered Slav, while Teuton worked side by side with Mongolian. The two most salient features of the construction were the laying of the metals along the shore of Lake Superior and the driving of the railway through the mountains west of the prairies. But the engineers began to appreciate the immensity of the undertaking not long after Montreal and Port Arthur had been left behind. Southern Ontario at that period was little more than a chaos of crenulated mountains, swamps, and dense forest land. Added to these natural hindrances were the Government conditions restricting the engineers to a maximum curvature of 955 ft radius and a maximum gradient of 52.8 ft per mile; and between Montreal and Lake Superior an altitude of 950 ft above the surface of the Lake had to be overcome. The railway builders encountered the barren and austere shore of this inland sea at Heron Bay, and followed the cliffs along for sixty-six miles to Lake Nipigon. The engineers, having been compelled to follow the shores of the lake, had to blast their way through solid rock a few feet above the water. The route was cut through projecting cliffs and ran over small inlets, which were either filled with the rubble from cuttings and tunnels or else bridged. One stretch through this district cost nearly £2,500,000, and in other places the expenses were £140,000 a mile. This region round Lake Superior had the reputation of being one of the most inhospitable and cheerless in all Canada. The gangs had little or no comfort; food consisted chiefly of oatmeal, pork, beans and bannocks. It was not surprising that the railway had its deserters. After the rock-bound shore of Lake Superior came the vast swamps - “muskegs” - of Southern Ontario to confront the builders with fresh obstacles. For weeks every conceivable method of conquering the swamps yielded the same result - failure. One swamp absorbed ton after ton of timber and debris, and still the permanent way remained uncertain. As the contractor’s engine passed over the metals the bed shifted and the rails sank. Bolts in the fishplates joining rail ends snapped and had to be replaced. Daily re-surfacing was necessary in some of the worst patches of the swamp section. Finally, however, the rails were kept in place by laying them across sleepers 40 ft in length. This portion of the railway, roughly 200 miles, was constructed in four years, and over £400,000 were spent in explosives, while twelve thousand men, two thousand teams of horses, and twelve steamers tor the transport of material and prov-isions were employed on the work. When the rails had passed Port Arthur the constructors battled through the forest lands of Western Ontario to Winnipeg. On this stretch of the track the gradients were carefully watched, and the embankments and bridges made in particularly solid fashion, as it was foreseen that the line would have to carry a vast amount of grain traffic from Winnipeg, the important centre of Manitoba, to the Great Lakes and the Atlantic ports. MEN AND MACHINES toiled unceasingly that the railway might bring civilization to the undeveloped interior of Canada. 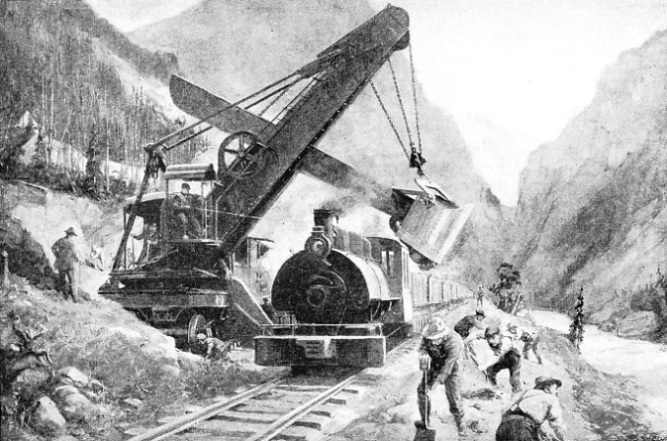 A great steam shovel is here shown in operation in mountainous country that would have been impassable without such aids to construction. Fleming’s suggested route from Winnipeg was rejected, and the track was laid nearer the International boundary. The reason for this was that the projected route traversed territory which was deemed too cold for settlers. Secondly, the company believed that if the line ran close to the border all danger of a competitive Canadian transcontinental railway being built farther south would be obviated. Also there was the consideration of cost, for although the Yellow Head Pass presented the simplest gateway through the Rockies, it would necessitate a great northward diversion of the track and more extensive bridge building. Time and money were scarce. The shorter route was the more obvious in such circum-stances, and so the railway proceeded due west, almost following the line of latitude fifty for some six hundred miles. Among the difficulties later encountered in building the railway over the prairie, report has it that bellicose Indian tribes also harassed the constructors, and that it was largely through the successful intervention of a Roman Catholic priest, the Reverend Father Lacombe, that several serious crises were averted. Embankments were constructed across the prairie wherever the terrain permitted, to afford the metals a better chance against the snow-drifts; for in winter the blizzards from the Arctic have a clear passage across the prairie, which is in reality a succession of steppes up to the foothills of the mountains. The cuttings were also excavated as widely as possible to avoid channels in which the snow could pile up and so block communication. Work on the prairies then proceeded with a rapidity unparalleled in railway construction. In fifteen months, despite the hard-ships of a winter, over seven hundred miles of track were laid by the contractors. The labour was broken up into sections, which were let out by the original contractors of the line to “sub-contractors”, thus enabling the work to be simultaneously proceeding over stretches of a hundred and fifty or more miles. The labour was divided into five-hour shifts. During the cold the men wore the thickest clothing available; large gauntlets shielded their hands from frostbite - 30 or 40 degrees of frost were not rare - and woollen socks were drawn over the high leather boots to prevent slipping on the ice. The prairie camp of each contractor’s “outfit” had a military aspect. One or two large dining-tents with the cooks’ quarters and an office tent generally occupied the centre, while around stood lines of small two-men tents, and on the outskirts the horse lines and rows of wagons. READY FOR THE ADVANCING RAILS. A new cutting, freshly blasted and levelled on a ridge of the Rocky Mountains. 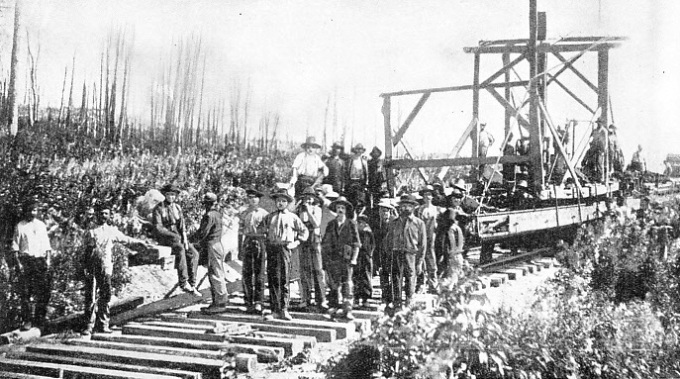 The rough line of “ties” or sleepers carried the rails of the contractor’s equipment. Meanwhile a railhead was also advancing from the Pacific eastwards to Kamloops, the 7,000 labourers on this section consisting for the larger part of Chinese. This portion of the railroad was constructed by the Dominion Government. The contractors had a formidable task. For instance, between Yale and Lytton the Fraser River had cut its way through the Cascade Mountains and offered continuous resistance to the pathmakers. During nineteen miles of the route thirteen tunnels had to be pierced. In this region supplies were brought up by means of pack animals over trails that made even the Indians hesitate. As construction progressed, the problem of transport grew more acute until it was resolved to attempt to navigate the turbulent Fraser River. A special steamer was built and a captain found daring enough to risk all in the uncharted waters of mountain canyons where the stream rushes along at 20 miles an hour. On the western portion of the CPR the company decided to invade the Rockies, with Calgary as their base and the Bow River as their route. The Government’s conditions were that the mountain transit must lie at least one hundred miles north of the American border and that the gradient must not exceed 106 ft per mile. The railroad began by covering a natural entrance called “The Gap”, then the rails were carried up to the summit of Kicking Horse Pass - 5,329 ft. This is known as “The Divide”." The construction over the summit was in the nature of a march, and offered no real obstacles, but the steep descent of Yoho Valley would have faced the engineers with a large amount of tunnelling had the 1 in 50 grade been preserved. So a temporary line, with a grade of 237½ ft per mile, was constructed, in a more or less direct course down this deep defile. The engine-drivers learned to abominate this section between the Great Divide and Field, which they dubbed “Big Hill”. Trains had to be kept under the most careful braking control in descending the incline, and “trap” sidings were laid to catch runaway trains, in the event of such a casualty occurring. “Big Hill” was a costly business, too, from the operating point of view; to work 700 tons of freight up it required the services of four powerful locomotives, two at the head, and two as “pushers” behind. LETHBRIDGE VIADUCT, spanning the Belly River in Alberta, is 5,330 ft long, and over 12,000 tons of steel were used in its construction. The long stretch of the viaduct is supported by thirty-three steel towers, and in one place the track is 314 ft above the river. At length the company decided that “Big Hill” should be abolished, and the railway re-aligned through the Yoho Valley. The engineers suggested a bold solution of the problem - the construction of two spiral tunnels to ease the gradient. The new route, no steeper than 1 in 45, crosses the Kicking Horse River and enters the Mount Ogden tunnel on the opposite shore. This tunnel measures over two thousand feet in length, and the train turns a complete circle inside, climbing all the time, and emerges from the exit portal high above the entrance. It next crosses the river again, doubles upon itself, runs parallel with the first stretch of line in a reverse direction, and finally enters Mount Stephen to complete another circle, after which it rejoins the old line. The actual boring of the tunnels was carried out from both ends at once. The incursions of water necessitated an extensive use of pumps, while the tunnels had also to be lined with concrete. The drilling continued even at night, the work being carried on by the light of flares. The cost of these tunnels bordered on a quarter of a million sterling, and over 1½ million pounds of dynamite were used for blasting. When, on the transcontinental railway, builders had overcome the Rockies by means of “The Great Divide”, the engineers found themselves opposed by an even more formidable barrier - the Selkirk range. 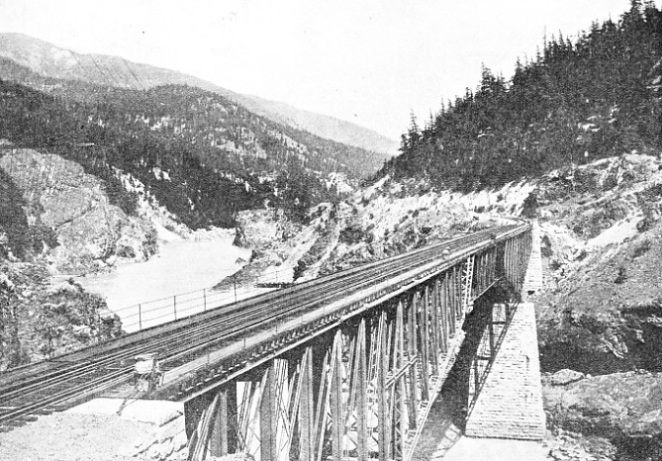 It was decided that the key to the Pacific coast was “Roger’s Pass”, and accordingly the railway was carried up from Golden to an altitude of 4,300 ft. Quite apart from the constructional difficulties, winter snows threatened to bury and destroy the metals, despite the protection of the numerous timber snow-sheds erected to cover the track. These were of varying designs: one of the most remarkable patterns caught the falling avalanche or snow-drift and threw the mass clear of the line, the amount of the clearance depending upon the speed of the avalanche. Also V-shaped or split fences were placed high up on the mountain slopes so that they divided and broke the force of the sliding snow masses. To give some idea of the gravity of the snow-slides, it is worth mentioning that avalanches on the CPR have been known to exceed a million tons, travelling down the hillside at a speed of sixty miles an hour! EAST MEETS WEST. In 1885 the advancing railheads met at Craigellachie, and on November 7 of that year the late Lord Strathcona drove in the last spike of the track, so linking the Atlantic and Pacific Coasts. The heavy timbering required by the snow-sheds necessitated special fire precautions, and the sheds were patrolled day and night, particularly during summer. Forest fires were then rampant, adding to the usual danger of the sheds being set alight by a chance spark. 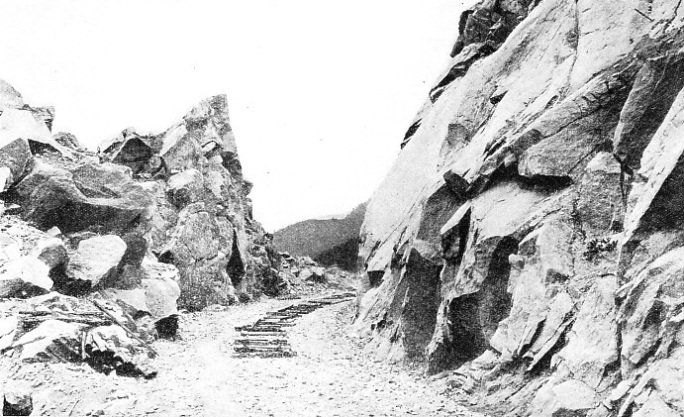 The four and a half miles of snow-sheds on the Roger’s Pass afforded not only insufficient protection to the rails, but also proved costly in maintenance. Apart from snow troubles, the maximum grade of the track reached as much as 116 ft per mile. This put severe limitations upon speed and the amount of freight which could be hauled. The difficulties multiplied as the traffic developed, and the railway engineers finally suggested tunnelling the mountain under Roger’s Pass. For surveying purposes the engineers climbed the adjacent Mount Tupper, planted a flag on the summit, and measured a route round its base. Mount Sir Donald, which had to be tunnelled, is 4,480 ft above the line. The actual site of the tunnel is south-east of Roger’s Pass, and a new approach line had to be built to the entrance. 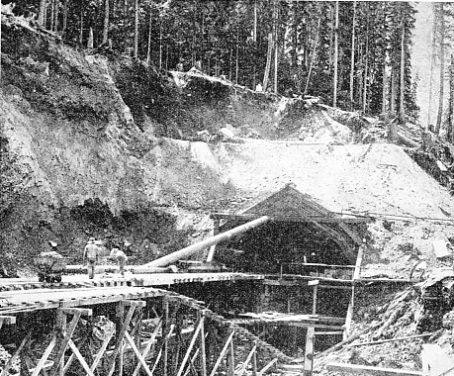 Although the Canadian Pacific Railway fully realized the immensity of the undertaking (the tunnel would be five miles in length), the company was in a hurry, and one of the contract terms was that the tunnel under Mount Sir Donald should be completed within three and a half years. THROUGH THE MOUNTAIN. This picture shows one of the entrances to the Connaught Tunnel during construction. The tunnel, 5 miles long, carries the line under Mount Sir Donald. The most outstanding feature in the building of this tremendous tunnel was the introduction of a preliminary, or “pioneer”, bore, a small tunnel driven 50 ft to one side of the planned entrance of the real tunnel. Then short galleries were blasted out at right angles to meet the centre line of the tunnel. When the excavators hit this centre line, they again turned at right angles in order to hew out faces in the main tunnel. As each gallery presented two working faces, a large number of labourers could work simult-aneously, and could also carry out their blasting operations without disturbing work in adjacent galleries. The blasting was continued night and day, the smoke being dispelled by a draught through the pioneer bore. Through the pioneer bore itself ran light railways for the removal of the rubble brought down by successive blasting charges. Apart from the internal excavations, attacks were made upon the mountain from either portal. The result of this “multi-bore” method of construction was that the main passage of the tunnel was clear from end to end after 704 days. Now came further excavations to widen this passage to the full dimensions required for the passage of trains. For this purpose the railway builders’ heavy artillery - steam shovels - joined in the battle. These huge machines scraped and dug away at the rock and moved forward on the average some 40 ft per day; and as the operations progressed the rate of advance speeded up. The amount of crushed rock these machines handled and emptied into the trucks on the light railway was estimated to have been approximately one million cubic yards. In the wake of the steam shovels came the small army of men whose job it was to line the entire tunnel with concrete. The tunnel was named “The Connaught Tunnel” in honour of the Duke of Connaught, then Governor-General of Canada. The tunnel is notable for the rapidity with which it was built and for the introduction of the pioneer-bore method then employed for the first time. The cost of the tunnel was roughly £1,125,000, but it shortened the route by four and a half miles. Not long after the opening of Roger’s Pass, the two railway armies from the west and the east met six years ahead of schedule. The Atlantic and the Pacific coasts of Canada were linked by the railway - the arduous explorations of men like Rogers and Moberly, the persistence of Sandford Fleming and other engineers had not been in vain. OVER THE SWIRLING WATERS of the Fraser, this fine steel bridge carries the line across British Columbia’s biggest river. On November 7, 1885, Lord Strathcona drove in the last spike at Craigellachie. And later Queen Victoria cabled congrat-ulations to the Dominion of Canada, on the termination of a work her Majesty considered “of great importance to the whole British Empire”. The first transcontinental train was run in 1886. To-day, at Craigellachie, stands an obelisk in commemoration of the completion of the Canadian Pacific Railway. The construction of the Connaught Tunnel was only one of the many revisions and additions the Canadian Pacific Railway has made on its line since it was opened to traffic. Among these improvements was the diversion of the Illecillewaet River, the flood waters of which had threatened the approach to the Connaught Tunnel. Either a viaduct had to be built or the river diverted. The latter course was chosen, and an embankment was thrown up and a great trench dug parallel to the railway through which the river was made to flow. The work at Connaught Tunnel eliminated the windings of the former route that included seven complete circles, and also the wonderful loops by which the engineers of the ‘eighties made it possible for trains to descend the mountain slopes. The elimination, too, of the four miles of snow-sheds through which the original line had to pass is certainly one of the most important factors from the traffic point of view. Formerly, during the winter and the spring, this particular stretch of line represented a perpetual source of anxiety; snow-ploughs and large gangs of men had to be always kept ready to hurry out along the track to deal with an emergency - perhaps an avalanche of crushing dimensions, which had broken up a snow-shed, thus completely blocking the line and suspending all traffic. WINDING ITS WAY through the Rocky Mountains, the CPR express shown here follows the route of the Fraser River, which reaches the Pacific near Vancouver. In re-designing the route the constructors were compelled to abandon the old station of Glacier one and a half miles to the south. A new station bearing the same name has, however, been built near the western portal of the Connaught Tunnel. This district has become a very popular tourist centre. For the convenience of visitors to the Illecillewaet Glacier the railway company had built a large hotel near the first Glacier station. The hotel has not been moved or abandoned, but an excellent road for cars gives the traveller easy access to it. From the new station the track pursues a straight course down the valley, practically parallel with the old line, which it eventually rejoins at Cambie. Another most important improvement on the trans-Canada line has been the construction of an alternative way through the Rocky Mountains. This latter route crossed the mountains at a comparatively reasonable elevation through the Crow’s Nest Pass, and incidentally taps a productive coal district. 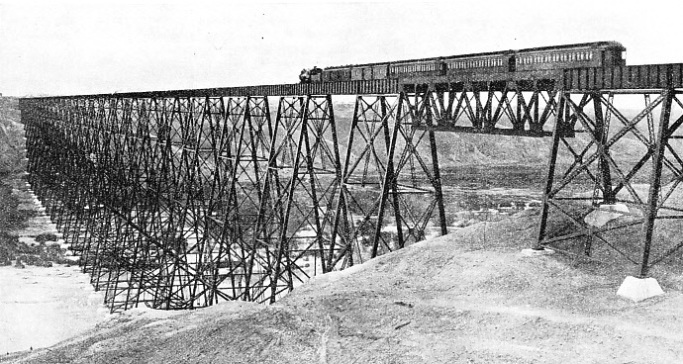 The train on the stretch between Lethbridge and Macleod passes over the famous Lethbridge Viaduct. When the section was first laid, the winding Belly River had to be crossed by a number of wooden bridges, while there were curves of 818 ft radius and gradients of 52 ft per mile. When the wooden bridges became unsafe, the engineers decided to rebuild the entire section and introduce two very long bridges. Of these the Lethbridge Viaduct is some 5,320 ft long, and in one place 314 ft above the river. The travelling crane which set the steel towers in place weighed over 300 tons. Owing to the terrific pressure of the wind, the riveters had to be protected in a steel cage, and only two lives were lost during the construction. In the building of the Lethbridge Viaduct, over 12,000 tons of metal were used and 7,690 gallons of paint. The story of the building of the Canadian Pacific Railway begins with a small band of pioneers, and ends with one of the greatest railway systems in the world. You can read more on “The Canadian Pacific Railway”, “The Doorway to Canada” and “The Opening-Up of Canada” on this website.